S5 Fusion - a universal template for Joomla 1.5 from Shape5.S5 Fusion - superb template for Joomla 1.5 from the studio Shape5. 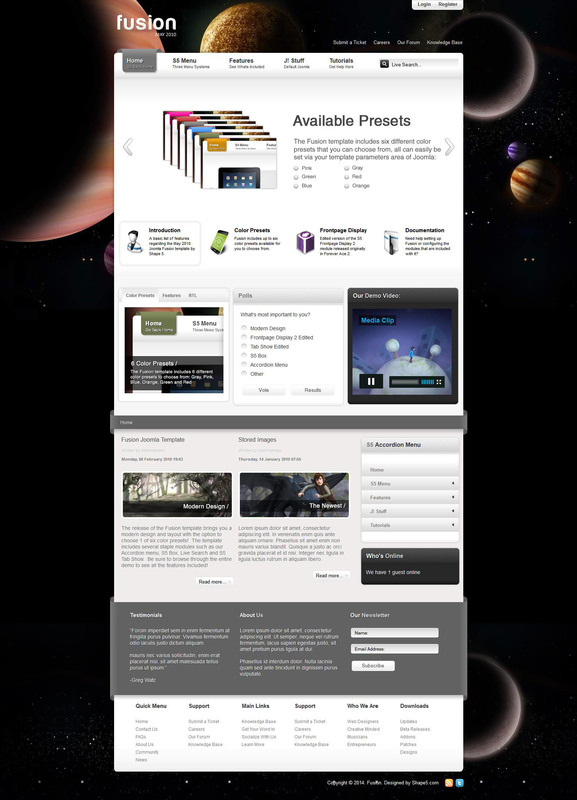 S5 Fusion template seo optimized, has 6 styles and 4 color settings. In the template, S5 Fusion present 27 module positions, S5 menu prompts output module and the ability to adjust the width of the site and columns. S5 Fusion can be used for business site and for entertainment portals. S5 Fusion template can be used on sites of different subjects, thanks to a flexible setup and a lot of GUIs, you can easily create website that will meet all requirements. Template S5 Fusion has a comfortable setting panel where you can adjust any parameter of a website without programming skills.